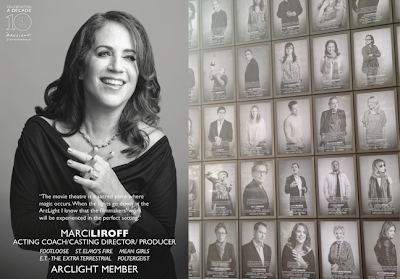 Casting: Behind-The-Scenes And Up On The Wall – Finally! Many times casting feels like an invisible job. No one seems to know or understand what we do as casting directors. Actually, if I’m doing my job correctly, the casting should disappear into the movie. The ensemble that I help put together with the filmmakers should work so well that you don’t realize that they are actors up there on the screen…just like how Meryl Streep disappears into every role she plays and becomes people like Julia Child, Margaret Thatcher and Karen Silkwood (Silkwood -a favorite of mine from director Mike Nichols). You can imagine my surprise when I was asked to be on the wall of some very notable filmmakers at The ArcLight Cinemas 10th Anniversary celebration in a poster sized photo. Shocked would be more like it. Casting is such an over-looked part of the filmmaking process. People that should know better – the producers, studio execs, network execs, writers, actors and some directors still don’t quite understand what it is that we do. How many times have you heard a director say, “Yes, I found her after searching high and low. I knew when I first set eyes on her that she was perfect for the part!” In reality, the casting director has been searching the globe, watching sometimes thousands of auditions in person and viewing hours and hours of auditions sent in from hopeful actors around the world. Joel Schumacher is a director I’ve worked with a couple of times who always gives me credit where credit is due. He will always make a point of telling people that I literally made him meet Isabella Rosellini years ago when we were doing a little gem of a movie, Cousins. The role wasn’t written for an Italian woman and Joel just couldn’t see it. I begged, I pleaded that this was perfect casting and would give us a sentimental thread to connect to the original film ours was based on, Cousin, Cousine. After spending just a few minutes with her, he knew she was the one and with a very easy re-write of a line or two, she added a wonderful element to the movie. I remember in my initial interview with Schumacher I suggested Mare Winningham for the role of Wendy in St. Elmo’s Fire. Sometimes you just know. Same was true with Lindsay Lohan on Freaky Friday. When I suggested her for the lead in Freaky Friday in my initial meeting with the director and producers, she had done The Parent Trap for Disney a few years back and for some reason they just didn’t want to use her again after she had already done a reboot of a famous film (both Freaky Friday and The Parent Trap were popular films in the 60s and 70s. Did you know Jodie Foster starred in the original Freaky Friday?!). I had Lindsay self-tape her audition from New York and when we saw it we were less than impressed. But, I still just knew she was the one. I talked to her on the phone and gave her some notes from the director and myself and had her do it again. The new self-tape was better – enough to have us fly her from NY to Los Angeles for a screen test. When she arrived for hair and makeup we were shocked. Lindsay was so embarrassed about her freckles, she had gone out and gotten a spray tan. She showed up sporting a bright orange glow. Think carrots. This was back in 2002 and believe me when I tell you that the technique of spray tanning has come a long way since then! We immediately hustled her into makeup where we spent the next couple of hours trying to “take down” her color to a human level. She won the role because she was so good with great comedy timing, and had great chemistry with our lead actress Annette Bening. – Sidebar: Lindsay tested with Annette Bening who was cast in the role of her mother. Two weeks before we were to shoot, we still didn’t have a full script. We were receiving the re-writes 10-20 pages at a time, and Annette just wasn’t comfortable going ahead without seeing the entire script and she pulled out. Because she pulled out, Tom Selleck, who was to play her fiancé, pulled out . Then Gary Marshall had to quit (he was to play her father) because his film Raising Helen changed their shooting schedule. Then Chad Michael Murry thought he should jump ship too. I talked him into staying. I think I threatened his future career truth be told! I came up with a list of replacements. I remember championing Julianne Moore. 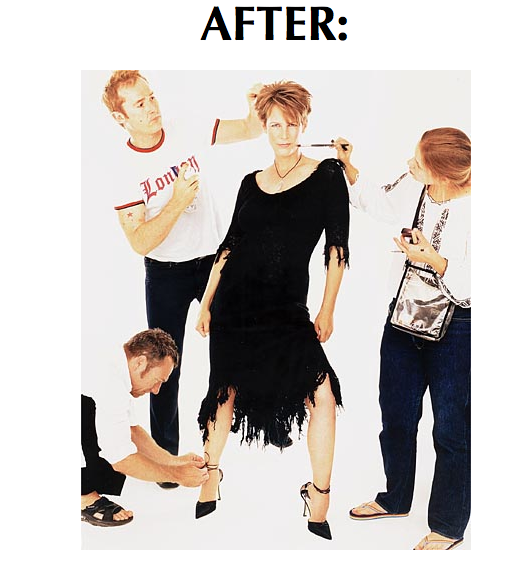 The head of the studio at the time, Nina Jacobson, had just seen Jamie Lee Curtis on the cover of Shape magazine. 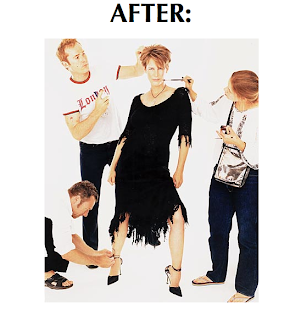 In the article, she showed the before/after photos of what a real woman looks like sans makeup and Photoshop. It was brilliant and the town embraced her. We hired her and she jumped in fearlessly into rehearsal and pre-production just 10 days before we started principal photography. The rest is casting history. Can you even imagine Annette Bening in this part? Another great casting story happened on the original Footloose. Many times I like to think outside the box when I read a script. When I was coming up with ideas for the Reverend Shaw role, I had just seen John Lithgow in Brian DePalma’s Blowout playing a serial killer as well as in The World According To Garp playing a transsexual who was adjusting to her new body. I thought he was a spectacular actor. The role was written as a salt & pepper haired, Paul Newmanesque, charismatic man. You can just imagine the look the director, Herbert Ross, gave me when I brought him up. This was another case where I stomped my feet and insisted he audition him. This was 1983 and I remember his audition as if it was yesterday. We read the scene where Shaw admonishes his daughter Ariel (played by me in the audition!) for coming home late because she’d been out dancing. Lithgow read the scene with such intensity and such love. I get chills whenever I think of it. The director gave him the role right then and there in the room. During awards season, when I see Martin Scorsese thank the brilliant casting director Ellen Lewis when accepting his award for his films and television, you know we’re getting somewhere! So you see, this is only a small part of what we do as casting directors. We help bring films to life by putting together the perfect ensemble of actors. I’ve always thought of myself as a filmmaker and I’m so glad others are starting to see it too. What are some films you’ve seen lately where you thought the casting was seamless and brilliant? What are some films you thought were miscast? Do you ever flub a line or get lost when you’re auditioning for a role? Your palms get sticky, your throat gets dry, you start seeing black spots floating in front of your eyes and you suddenly can’t hear?! Fun…right?! Actually, no, it’s not fun at all! It’s a horrifying feeling when that happens and I’m going to tell you how to win over the room when this happens. Yes, you heard me….win them over. Here’s what’s happening when you’re auditioning or performing live. I liken it to a tightrope walker. 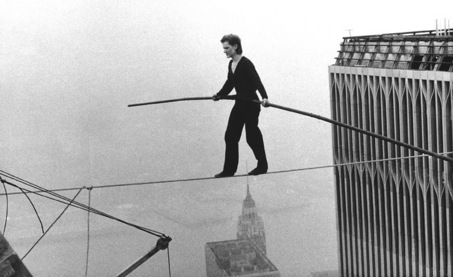 When the tightrope walker is up on the rope, the whole audience is rooting for them. They are on the edge of their seats with anticipation and are subconsciously praying for them to do well. When the tightrope walker missteps and loses her footing and almost plunges to the ground (or rather the net! ), the entire audience gasps. But, when the tightrope walker gracefully and masterfully recovers and rights herself back on the rope the entire audience springs to their feet and applauds. 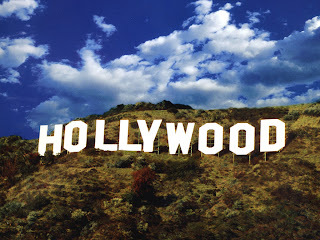 Likewise, when you’re in an audition and go up on your lines, it’s how you recover that can either make or break you. If you dissolve into a puddle on the floor with “I’m sorry’s” or “Can I please, please start over again? !”, or “Damn, I f*cked it up again!”, you’ve essentially just lost your audience. Yet, if you can gracefully dip down and check your sides (because in your preliminary auditions you’ll still be holding your sides and turning the pages along with your scene), find where you are, and look up and continue…..you’ve just won us over. It’s as if you’ve almost fallen off the rope, corrected your footing and gotten back onto the rope and pulled off your trick. We’ll follow you anywhere. Another smart thing to do is if you’ve just started your scene and you feel you are way off-track from what you’d prepared – say, “I’m going to start again”…..compose yourself, and immediately start again. When you start saying “I’m sorry, can I please start over….please?! !” you’ve lost us because you’ve lost your power. Remember…this is your audition. Take charge, take control of the room. I don’t mean you should act obnoxious or needy or demanding. There’s a fine line between being charming and in control in an audition and being a diva. And please, don’t do this when you’re 2-3 pages into your scene! We want you to succeed. 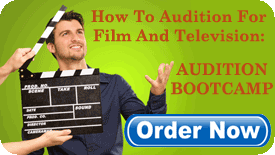 How you behave in an audition is indicative of how you may be on set. A true pro wouldn’t fall apart because they forgot or screwed up a line. Hey we’re all human. ALL of us. It’s just a line, you didn’t run over my dog, it’s not the end of the world. But, how you handle it is everything. Everything. Many of you ask me if we expect you to be off book. For the first audition, we expect you to be completely familiar with the material, have read the script if available, and have made distinct character choices. You can look down at your sides for reference. But, as you come in for call-backs 2 and 3 times, and certainly for any test at the network or screen test on a film – yes, be off book. You can still hold your sides if you need to, but be off book. As you know, competition is SO stiff, and if the next guy is more prepared than you, then it doesn’t make you look very good. For us, your behavior in an audition is indicative of how you’d be on the set. Why would you NOT want to be as prepared as you possibly can? I always say, THIS IS YOUR JOB PEOPLE! Why would you come in and do a “sort of good” attempt at the material when you can be GREAT?! You’ve spent years training, you’ve done the work, you’ve studied, now go out there and be as fabulous as you can. Being off book allows you to connect to the person you’re reading with. It makes your audition look more authentic because you are PRESENT in the scene. When the actor is continually looking down at his sides you sort of break the spell that you are trying to create. As the viewer or reader, it takes me out of the scene when an actor is reading off the page or continually looking down at his sides – usually at a crucial moment in the scene. Being off book means you are going to be on your toes when that rare moment comes along and the director actually gives you notes in the room and asks you to do it again. Yay you! It means that he/she actually SEES something in you that makes them want to see the scene again with their re-direction. It means they want to see if you actually CAN take direction. Because you know the material like the back of your hand, you’ll be able to LISTEN and weave those notes into your already fine-tuned and thought-out performance because you’re not struggling with the lines. Currently I work with a director who is very articulate in “actor speak” and he’ll give you 10 notes on a scene and expect you to integrate them into it. Try that if you don’t really know the lines? Your head will explode! Hot tip #1: Hold the sides in front of you. Turn the pages along with the flow of the scene so that if you do get lost, you can easily dip down and find your place and continue along, with ease and grace, and we don’t have to stop and start over. If you get lost – how you get back on track is also something we look for. If you have a total meltdown and start apologizing and freak out and dissolve into a puddle because you got lost or have to start over – that gives us pause because we wonder how you will be “on the day” if you aren’t handling things well in our little office when the meter isn’t running yet! We’re all human, we make mistakes. How we handle them is the key. Hot tip #2: Holding the sides also shows the executives (network and studio) who are watching this audition outside the room, that it is a work in progress. It’s not a finished product. You can’t imagine how much they all scrutinize your performance. Since they’re removed from the work space (our casting office) they sometimes forget that we’re still playing – this is not a finished performance. When they catch a glimpse of the sides, it plays subconsciously into their viewing skills and reminds them that – oh yeah, these aren’t dailies. It’s subtle but it works. Hot tip #3: Your memorization skills also come into play when you’re actually shooting. I cast a tv series last year and I couldn’t believe how often lines were flying-in as we were shooting the scene. Both producers were writers on the show and they were changing-up dialog while shooting. If you don’t have this skill-set now, go get it! Develop it. It’ll be the sharpest tool in your bag that’ll take you a very long way in this business. Hot tip #4: Have you ever been given a scene and the other person in the scene has a long speech and they skip over the whole speech and just read the last line?! You’re all prepared to be listening and responding to the speech and they’ve jumped ahead and you’re totally thrown. Ask FIRST before the audition starts if we’re going to be doing this whole speech or all this dialog within their speech – then you’ll know whether they are going to skip over it or not. I usually advise my coaching clients to ask the CD or reader: “Can you please read the whole speech as it’ll help with my reactions?” Good idea, huh? 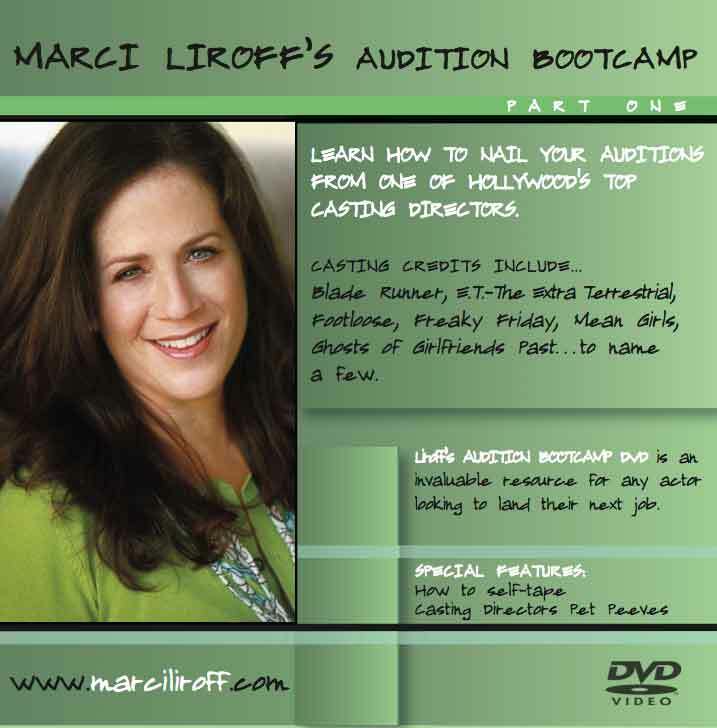 For me – one of the key elements in an audition is whether an actor is LISTENING. Whoever these CDs are that are skipping over large chunks of dialog so that they can get to your lines are SO missing the point here. I love to see the look on the actor’s face as he’s comprehending and reacting to what the other character is telling them. There are many ways to memorize lines – you have to find the system that works for you. Practice. You can learn a scene or a monologue every day and it’ll help your brain start to become comfortable with this process. Here is a long list of ways to learn lines. There’s also a great app called Rehearsal which is great for memorization along with other wonderful bells and whistles. Figure out which one works for you and start sharpening your skills. In closing, please know that we’re not just looking for the actor that can memorize all the lines. That’s just one very small part of your performance. How you interpret the scene and the character and make it your own is what we need to see as well. Along with knowing the material well, you’ve got to be able to change things up if/when the director gives you adjustments. I see some actors get so locked-up in the way they’ve rehearsed it that they can’t make any changes. We need to see that you will be able to adapt to any changes that come along. You can read a version of this article on BackStage Magazine.